Some hedgehog enthusiasts recommend keeping hedgehog cages in areas that are not high traffic areas, so as not to disturb the sleeping hedgehog. Others recommend that keeping the hedgehog in a busy area of the house allows the hedgehog to become accustomed to the family and increases likelihood of interaction with the family. One should be considerate of noise that may be perceptible to hedgehogs but not to humans. For instance ultra sonic devices used to deter small rodents are extremely disturbing to a hedgehog’s sensitive ears. Computers and other electronic devices may also emit a noise that some hedgies may find disturbing. We find that playing music is helpful to our animals. Regular noise throughout the day is muffled by the radio. Again, be considerate of the hedgehog, in music selection and volume. Hedgehogs need regular day and night cycles to keep their biological clocks in balance. Their natural habit has very little seasonal variation in the length of day and night. Hedgehogs kept in basements or windowless rooms should be provided ultra violet light that has a cycle maintained on a timer. The ultra violet night is necessary for vitamin D production and general well being. Hedgehogs should NOT be kept in closets or in the dark. Likewise they should not be kept in direct sunlight as this can be damaging to a hedgehog’s eyes over a period of time and the temperatures may get too warm. African hedgehogs, which are the only ones kept as pets in the US, have very little seasonal temperature variation. Pet hedgehogs are not able to adjust their body to night temperatures as do wild hedgehogs. Hedgehogs prefer temperatures that are warmer rather than cooler in temperatures. Cages should be placed on a table, stand or shelf to keep them up off the ground where temperatures are cooler. Cages should be placed in a warm, comfortable room in an area that is free from drafts and should not be placed in direct sunlight. Normal sunlight in a room is fine, but temperatures in direct sunlight can be much higher than in the rest of the room. Be cautious of placing your hedgehog’s cage directly under a ceiling fan. This can provide quite a draft for your hedgehog. Many breeders and owners have found that hedgehogs seem to prefer the warmer end of the temperature range and are most comfortable between 75 and 80 degrees Fahrenheit. Hedgehogs tend to be healthier, more active, and eat better in warmer temperatures. Some references indicate that hedgehogs can tolerate temperatures as low as 65 degrees Fahrenheit, but it is most breeders’ experience that temperatures this low can be dangerous for your pet. A chilled hedgehog will attempt a false hibernation and that can be deadly. Lower temperatures can be an environmental stress for your hedgehog, which will affect the overall health of your pet. Refer to our articles Heating Options, Power Outages and Temperature Requirements guide for more information on this subject. When compared to other animals, hedgehogs do not make very little mess outside of most cages. 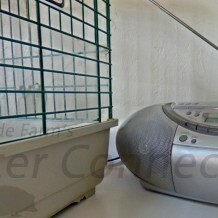 Hedgehog cages shouldn’t be placed on a kitchen counter top or any other area of human food preparation or eating area. Pet hedgehogs should always kept indoors. Screened in porches are an acceptable place to play depending on the seasonal weather in your area. Hedgehogs are very sneaky will take any opportunity to hide so they need to be in an area where they can easily be found if they happen to get out of their play area.